It must be many years since there has been a report of anything 'miscut'. At one time machine-vended booklets were found miscut, with the vertical columns of stamps transposed, and occasional folded booklets were found with the rows of stamps transposed. Now we can report a miscut counter sheet. Most stamps sold at Post Office counters are in sheets of 25, but NVI values are distributed in guttered sheets of 50, two panes of 25. These guttered sheets have the cylinder number, grid position, and sheet number and printing date against the lower pane. Thanks to a reader we can now show a sheet of 1st class Large stamps, printed on 02/04/13 with all these details against the upper pane. We understand that a number of these sheets exist, but we do not have stock. I appreciate the humour in the coment but a guillotine really wouldn't work would it ? Looking at your example I'm not to sure. What is 'Anonymous' on about? I have seen these sheets and they are miscut. The darker area going across the centre is most likely the clear plastic strip is was scanned in if that is what Anonymous is on about. You misunderstand my point, with a good guillotine you could make a few of these to pass off as examples to the less than knowledgeable collector. You seem to have totally misunderstood how these are produced and what exists. The sheet consists of 50 stamps. Pane A is normally above Pane B, the latter having the cylinder number, sheet number and printing date. These sheets have Pane B above Pane A: there is no way you can alter A/B to produce B/A unless you peel off the edge strip, cut it and reposition it. And then the deception would be obvious wherever you butted up the cuts in the two strips. Now, if we have all misunderstood your point, pray do explain how you would create a B/A combination from a normal A/B sheet. 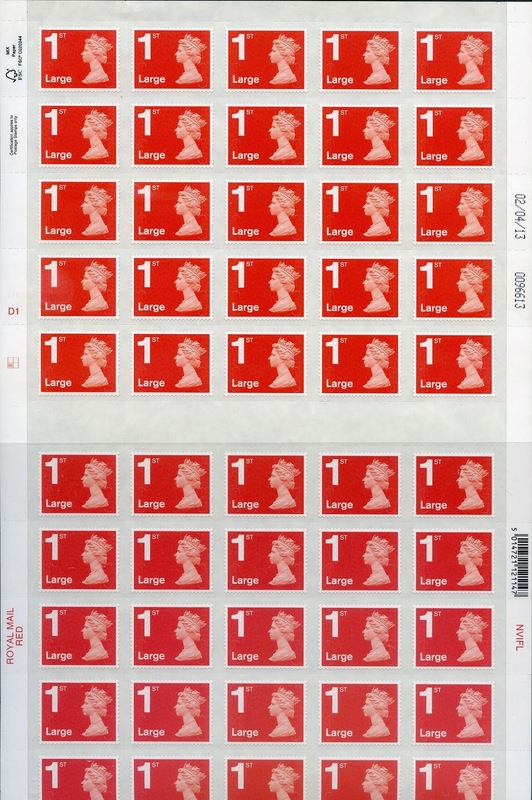 Are the miscut sheets complete with a lower margin or are they like illustration above end at the 5th row with the cut between the “1st Class” and “Large”? Complete as delivered to the Post Office - there's only so much can be fitted on an A4 scanner, though. The cylinder number and date should be on the lower pane of 25. Instead they are on the upper pane. The colour name should be on the upper pane of 25. Instead it is on the lower pane.